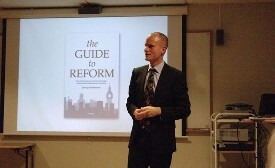 Reform Event in Copenhagen. I just left the event arranged by CEPOS in Copenhagen about my book. Very well arranged and attended. It was also interesting indeed to listen to the comments on the topic - not least based on personal experience - by Henning Christophersen. After all, he has been both Finance Minister and EU Commissioner. A few blogs have also written about the events in Malmo and Lund yesterday - here, here and here. Kvallsposten also has a very positive editorial article from the event today, read it here.